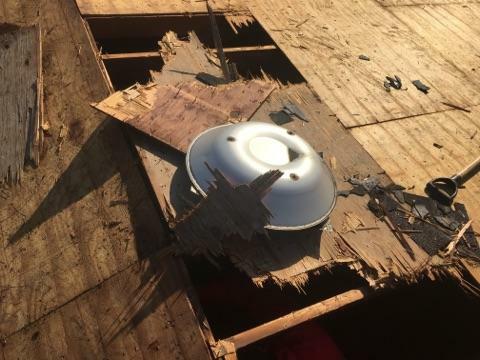 One of the last things a roofing contractor wants to experience is a roof damage emergency. Unfortunately, nature and weather is is uncontrollable and often unpredictable. When a roofing disaster hits, it is important to get the roof professionally repaired as quickly as possible so that the damage spreading inside your home is stopped before it can happen. At Bone Dry Roofing, our experienced team of roofers are always prepared to depart at a moment's notice with all the tools and knowledge necessary repair any type of roof leak or damage your house may have as quickly and effectively as possible. As one of Greater Cincinnati's leading roofing companies, our talented roofing crews are trained to work with all types of roofing materials so that they can resolve any issues you may have with your roof. If you've had the misfortune of a roofing emergency or are in need of one of our many other professional roofing services, call us at 1-844-385-8388 or click below for a free estimate! We offer all our services in Dayton, Cincinnati, Hamilton and the nearby areas. What are the causes of emergency roof damages? After suffering from extensive damage, your roof will require a fast response. Our experts provide temporary protection, such as tarps, to prevent water and wind damage while we attend to all the necessary roof repairs. In the case that your roof is far too damaged, we can also carry out a full roof replacement. You can expect our roofing specialists to help you streamline your communication with insurance companies and coordinate with other companies to ensure that all work is done correctly and that your roof's water damage is kept to a minimum. As an experienced and trusted roofing contractor in Greater Cincinnati, we can handle any emergency roof repair need you are needing. If you have noticed leaks, wind damage, or even a collapsing roof, contact us right away to get fast, effective repairs. Call us today for a free estimate on any of our roofing services! We work throughout Hamilton, Dayton, Cincinnati, Fairfield, Loveland, West Chester, Middletown, Mason, Miamisburg, Ft Mitchell and the surrounding areas.